The festival ‘’Film & Media’’ (FMF) was organised at three locations this year. 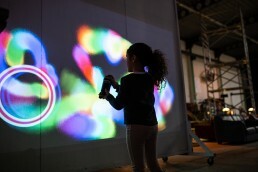 The program of the festival was based around film and media art and the most recent technological developments. The organisation of the festival wished to give their visitors an experience that would fit this combination. To realise this they used the AR Graffiti Wall. 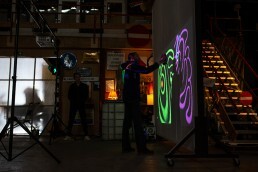 "For a festival it is a beautiful addition as well as interactive"
The AR Graffiti Wall makes it possible to spray virtual graffiti on any wall. You do not need any paint, because you spray with light. A panel makes it possible to switch between different colours very easily. Visitors could let their imagination and creativity run free. The space where the AR Graffiti Wall was placed, was soon filled with bright colours and unique creations. The AR Graffiti Wall was a great addition to the festival. 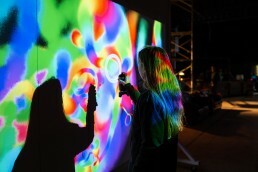 Not only because visitors could interact with the AR Graffiti Wall, but also because it combined technology and art. ‘’It is just like a chalkboard, but a modern one, with beautiful colours and of course the new technology’’ said Nina Bakker of Film & Media Festival Alkmaar.